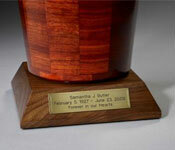 The Peace wood urn features a classic, sophisticated design that will honor your loved one. 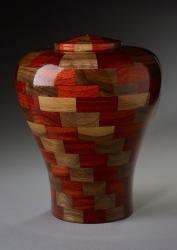 This wood turned urn is handmade in the United States by Steve Shannon. He first pieces together Maple and Black Walnut wood segments that are hand turned and finished with a UV protectant. 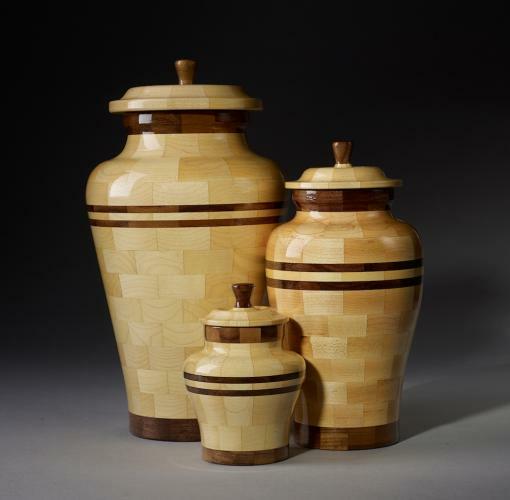 The artistic-inspired Peace cremation urn is available in keepsake, small, and large sizes. This urn caught my eye immediately when I started to shop for one. The price was more than i had wanted to spend but after several days of searching I couldn't find anything nearly as beautiful. When I placed my order I was contacted to ask when I needed it and it was shipped to arrive in time. The quality is excellent as I expected. The only con I found was that I didn't want to just pour the ashes into it and the opening was too small to transfer the ashes in the plastic bag they came in from the funeral home. This required transferring the ashes to another plastic bag placed inside the urn. I don't consider this a major drawback as making the mouth wider would affect the aesthetics of the shape. And I'm sure that the funeral home would have taken care of the transfer had I asked. Overall I am extremely satisfied with this purchase.